Sensationally coloured foods have a short shelf life in the Instagram news cycle. Unicorn lattes might last a few months, before fading from view. Black foods are an exception to the rule. Two summers ago, black ice cream was a social media sensation, thanks especially to the glossy, black coconut ash ice cream from Morgensterns in New York, followed up by Goth soft serve from Little Damage in Los Angeles. Instead, black-coloured foods have proliferated. Among the reasons are the popularity of bitter, charred foods from such places as Scandinavia, the acceptance of squid ink as more than a novelty ingredient, and the rise of activated charcoal as a health food. And there’s the visual impact, which should never be underestimated in this age. In South Korea, an entire holiday celebrates black food. On 14 April, Black Day, in a ritual that started in the early 2000s as the antithesis of Valentine’s Day, single women and men wear black and eat black bean noodles (jjajangmyeon). Sales of black coffee reportedly spike as well. If there’s one ingredient driving the black food trend, it’s squid ink. Chefs are using the ingredient to rethink notable dishes from around the world, even one of the original black foods: squid ink pasta. When he’s not splashing luxury vinegars on salmon tartare, Michael Vignola at Henry at Life Hotel in New York offers home-made cavatelli with squid, shrimp, and fennel on a pool of inky “sauce Nero" instead of the traditional black pasta. “I was thinking flavour first, aesthetic second." Besides squid ink, he fortifies the sauce with super-charred, wood-fired bread, so it’s extra-dark. Of the black food trend, Vignola sees two factors at play. First is pricing. “I’m looking for more ways to cook nose-to-tail: It’s my environmental duty as a chef, but it’s also an economic one. Ingredients are so expensive, you can’t not get creative in finding ways to use all of your product. The ink from squid is a perfect example. Another way is to use ingredients like leeks that might just be lost to a stock pot, by incorporating char." Which leads him to the second factor: flavour. “It’s a departure from the classic French technique we learned in culinary school, which frowns on anything burnt," he explains, “but now chefs are playing with char for flavour and texture, and diners are into it." 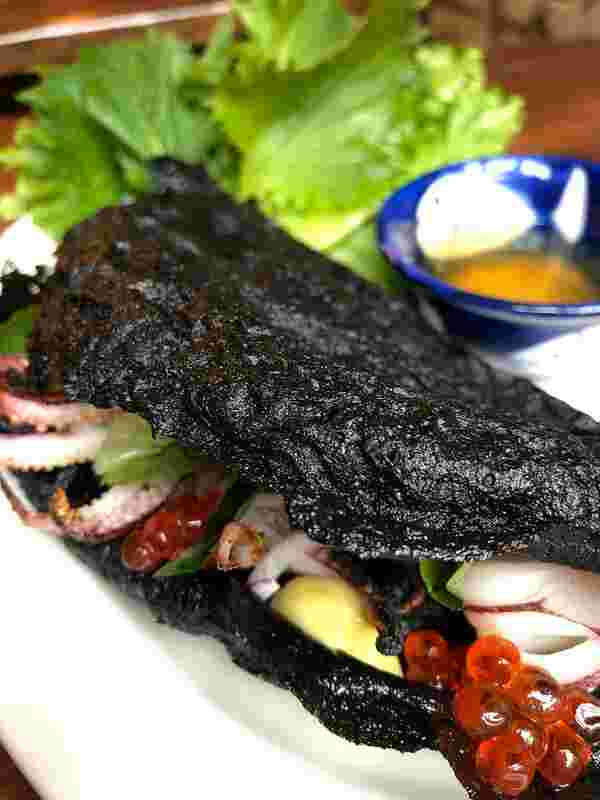 Farther downtown at Hanoi House, chef John Nguyen adds squid ink to colour his grilled seafood-filled Vietnamese rice crêpes. He credits classic European cooking influences as his motivation. “Asian chefs who grow up in the US normally learn French or Italian food as their cooking foundation," says Nguyen. “The combination of squid ink with seafood is such an Italian classic. It’s one of my favourite ingredients to cook with now." 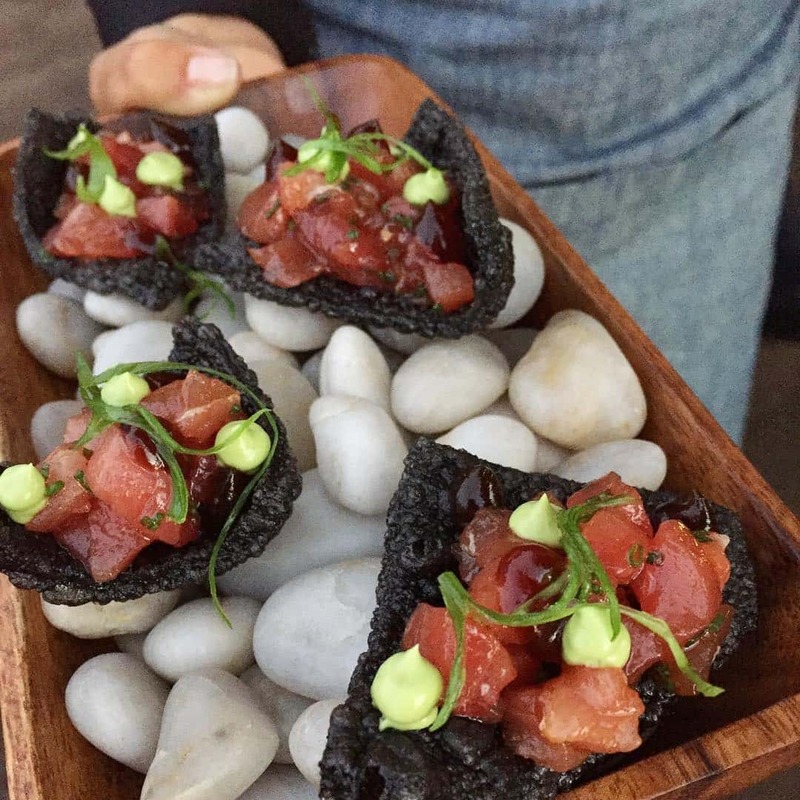 In Honolulu, Senia chefs Chris Kajioka and Anthony Rush use squid ink when paying homage to the ubiquitous Hawaiian poke, serving the raw, chopped fish salad on airy, black crackers. “They’ve become a signature snack that will always be on our menu," says Kajioka. “We make the crackers black to resemble coral, so it has a direct connection to the tuna. Not only are they visually striking, but charring and blackening is in our cooking repertoire because it creates another layer of flavour." At Del Mar in Washington, (pro tip: don’t miss the charcuterie here), it’s the burger buns that are going dark. 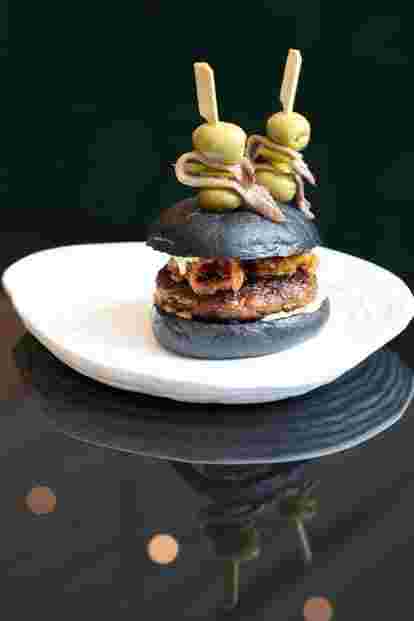 “The idea was to spin the classic bocata de calamares [calamari sandwich]," says chef Fabio Trabocchio of his chorizo burger on squid ink brioche. The jet-black bun is also stuffed with fried wild calamari and pepper aioli. “What’s important to understand is that it’s not just cosmetic," Trabocchio continues. “Squid ink provides a wonderful, deep, rich sea flavour to whatever dish it’s used in. Now it’s having a broader moment." In the Northern Catskills at Deer Mountain Inn in Tannersville, N.Y., Michelin-starred chef Ryan Tate chars the majority of dishes on his tasting menu. Black-hued courses include quail eggs coated in hay ash; rainbow trout topped with fried black trumpet mushrooms and served in a sauce of black truffle jus; and venison cooked in charred leek ash. “I see a lot of black foods from European and Scandinavian kitchens. Chefs like the bold look, and it is Instagramable," says Tate. “But it’s coming from a larger appreciation of Japanese cooking that is resonating with diners. Chefs have been exploring it for years, and now the dining public is beginning to accept those flavours." At the updated Italian red sauce spot Don Angie in New York, co-owner Angie Rito makes her version of tiramisu with a rich, jet-black cocoa cake, topped with espresso-soaked ladyfingers with and a heavy dusting of alkalized black cocoa powder, which—depending on the lighting—can look blackish-purple or a deep, dark brown. “We chose to use black cocoa because of the especially dark, intense flavour it imparts. The cocoa’s bitter notes add a savoury element to the dish, so the dessert isn’t too sweet," says Rito. “It also creates a stark colour contrast within the dish between the black cocoa cake and the white zabaglione cream—so the end result is a more interesting combination of black and white, instead of just drab shades of brown." Black continues to play in the ice cream world, too. Portland, Oregon-based Salt & Straw is renowned for wacky ice cream flavours, such as goat cheese and black olive brittle, that it ships around the country. But at its soft-serve dessert bar, Wiz Bang, the Rocky Road Magic Cone is served in a black-charcoal cocoa-waffle cone. “The cocoa cone is starkly beautiful—it pops!" says co-founder Tyler Malek. “Bold colours in ice cream have been so popular this last year. My favourite part of this black trend is that people are having fun with these visual cues while avoiding traditional, artificial food colouring. It forces a different sense of creativity." With the arrival of spring, Malek has other colours on his mind: “We’ve been blending fresh flower petals into cream, yielding ranges of colour from pale pinks to gentle blues." He’s also working with berries, one of which gives the ice cream a bright purple hue—right in sync with ultraviolet, which Pantone picked as colour of the year. Your Instagram feed is waiting.